RAM Engineering was started in 1992 by sole proprietor Tamara Martin, a Registered Environmental Health Specialist (REHS). 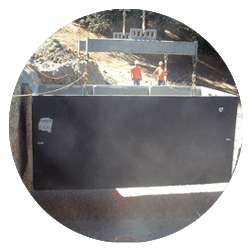 Named after well-known Sonoma County civil engineer, Robert A. Morrison, RAM Engineering provides wastewater and civil engineering services in the North Bay and Central Coast. Our strong working relationship with local regulatory agencies allows us to focus on meeting our client’s needs, providing timely, high quality wastewater and civil engineering services. Our wastewater division, led by Tamara, specializes in the evaluation, assessment and design of on-site wastewater treatment and disposal systems for rural residential and commercial developments. Our projects range from repairs or expansions of existing systems to new innovative system designs. Our civil division, led by Steven M. Martin, PE, specializes in creating civil sitework designs including roadway design, grading, drainage, and erosion control plans. RAM Engineering clients include architects, property owners, engineering firms, land surveyors, real estate agents, and wineries. © 2007 All Rights Reserved. Site Designed by Planeteria Web Design.